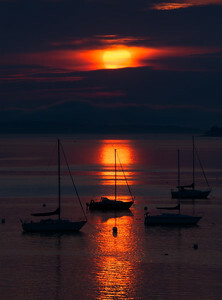 It's hard to explain how much I am obsessed with Maine coast. 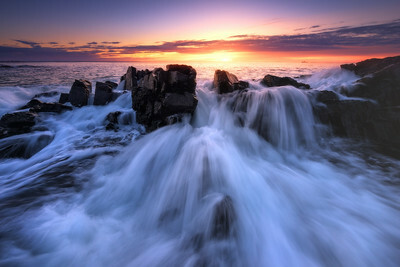 From the easternmost shores to the beaches of York, I can spend a lifetime taking photographs of waves, rocks, boats, lobster traps, lighthouses or amazing sunrises over the water. 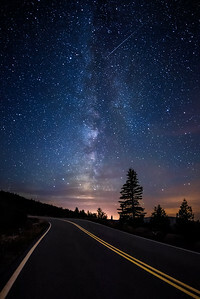 Acadia has a very special place in my heart - it is our family tradition to vacation there, hike the mountains, watch the passion of Atlantic Ocean, gaze at the stars and Milky Way, have campfires and be so peaceful and content. 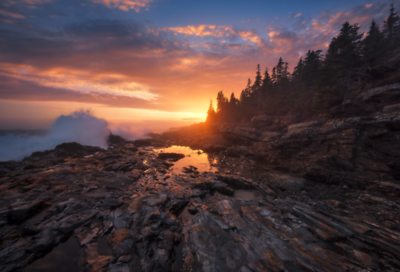 I love MDI and its fishing harbors, Schoodic Peninsula and rugged coast line along the Ocean walk, popovers at Jordan Pond or strolling through the early morning on the streets of Bar Harbor. The very sad day I dropped my D810 camera into water. But it did not happen here, where one would thing would be more dangerous of a place, as the storm was just rolling in at full force into Mount Desert Island. Several hours later my 3 year old son knocked it down into a lake where water was so peaceful and calm that could have been painted by a watercolor artist. Thanks to Amazon.com, I had a replacement overnighted in order to continue my week long shoot. 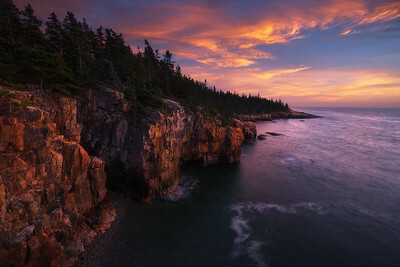 Much less visited because of the one hour drive from the tourist filled Bar Harbor, yet to me it quickly became my favorite because of much more pronounced sense of wilderness, beauty and adventure. There are no paths to this particular spot, so naturally I was there all by myself. 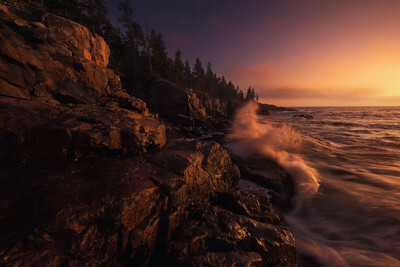 When the rogue wave hit me from the side and covered my camera, tripod and the rest of my gear - the adrenaline levels went through the roof: the rush, which I'm obviously addicted to, reminded me yet one more time that life is truly beautiful and amazing. My favorite time of the year is just around the corner. August nights get cooler and cooler and remind me that golden red fall is just a few weeks away. The air becomes crisper for landscape photography, clouds change shape, sun light is different and maybe I will have more time and motivation after a very busy summer. 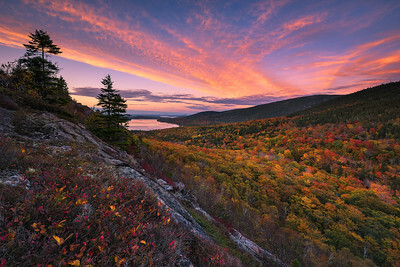 For those of you that love to shoot yourselves, this is the best time for photography in New England. The scene behind me has been shot a million of times. It is one of my favorite lighthouses on a coast of Maine - Pemaquid Point. 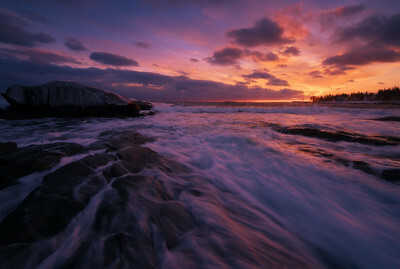 Yet sometimes the best light is not where you want it to be... so here I am shooting a sunset among ice covered rocks. Cadillac Mountain, Acadia National Park 2 AM. 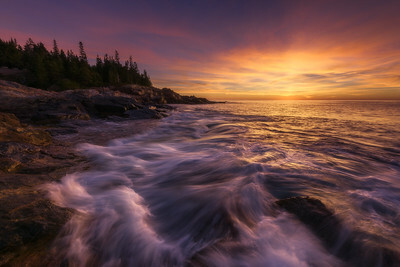 I was just about to shoot some really amazing skies in Acadia when a text from my wife lit up my phone - "Baby won't eat and kids are awake. Great times". So this is the only shot I took, packed up and left. 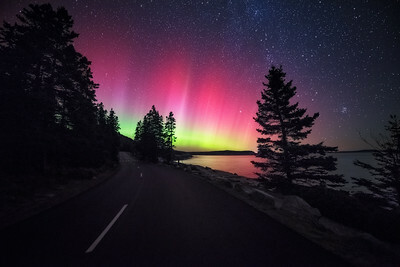 Northern Lights Display in Acadia National Park, Maine. I usually shoot alone. Not because of the loner mentality but more of the solitude, relaxation and truly getting deeper understanding of things around - trees, ocean, rocks, grasses or simply sounds and the smell of air. This particular night I asked my wife to join me, since she never seen me shoot Milky Way before and I thought it would be fun to be in the park alone together ( all National Parks were closed due to The Government shutdown). She actually should get the credit for this photo. Here looking at the lights, we are facing North. Milky Way this time of year is in completely opposite direction - moving from south to the southwest as the night rolls on. Without her drinking wine from the plastic cup (romance!) and saying "hey what is that" I would probably never even looked behind to see this amazing miracle of nature. So get out there, experience everything the world has to offer and look in every direction, because the right side of the night could be behind you. So this is Ravens Nest. 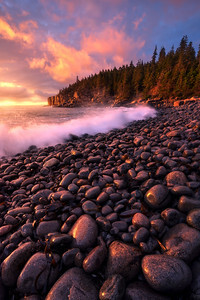 It used to be somewhat secret, less known area of Acadia's Schoodic Peninsula - I had to really put quite an effort to find it a few years ago, as it is an hour drive north from Bar Harbor area. These are some of the highest cliffs in Acadia and the first time you are there it will guarantee to take your breath away - its very dramatic even if the tide is low. Chances are you will still be the only person there and that will only add to the incredible realization of being a tiny human among the wilderness of the park's nature, vastness of Atlantic ocean and immense beauty of the open sky. I stumbled on this scene by accident. 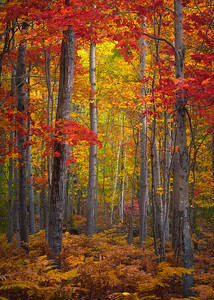 Walking through the trees and ferns late October afternoon just zoning out, no camera, no particular thoughts really. I could not believe my eyes. 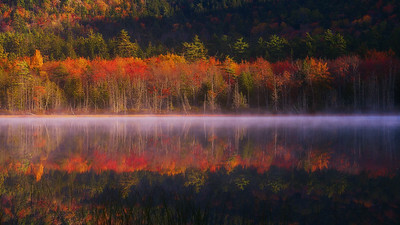 I have never seen anything like this in all years I have visited Acadia - the colors, contrasty and saturated were so bright, three-dimensional and truly grand. I stood there for several minutes. Looking up and all around. I needed this, I was looking for inspiration, to be motivated in my photographic journey as this year has been the hardest to find the time or desire. You judge for yourself - to me, it was an instant blush to my face, blood rushing to every fingertip and than... silence. A perfect moment with nature. 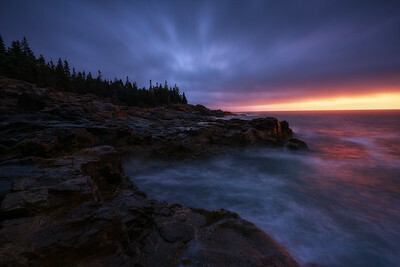 This is quickly becoming my go to spot for sunrise in Acadia - although lately I'm no longer alone there... This is also "my spot in the park" to get wet because of some rogue wave - thankfully this morning my camera returned home undamaged. 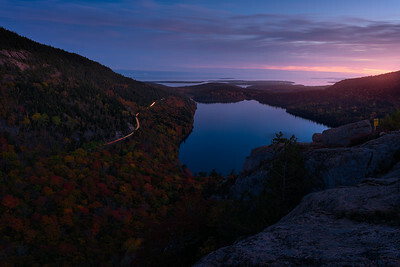 This was one of the prettiest sunrises during my annual pilgrimage to witness the autumn grandeur of Acadia - as always I enjoy something just a bit dramatic and full of emotion. Hope you do as well.